Derek Lam’s fall 2012 collection is quite subdued, particularly when it comes to color, but it’s also imbued with enough shape, structure and texture to form a lasting impression. 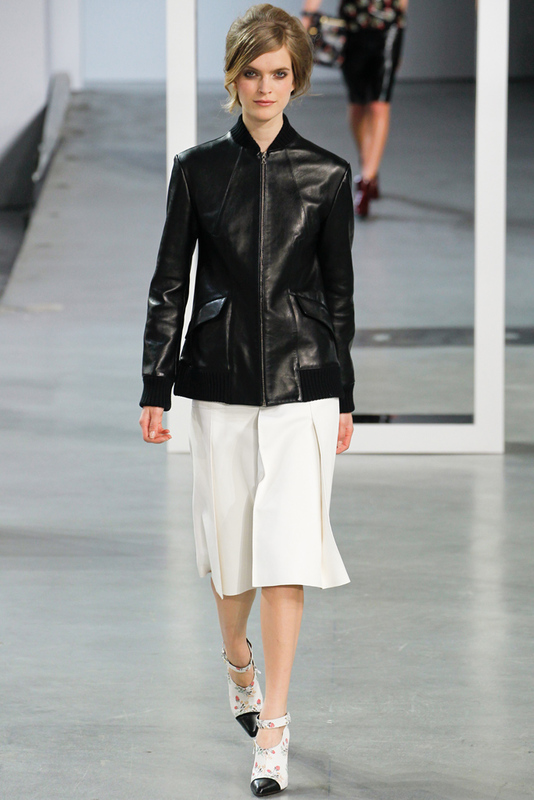 I really liked this lean black leather bomber and A-line skirt with inverted pleats. The ankle straps and toe caps were great updates on the ubiquitous shootie (though I can do without the schoolgirl calico print). How to re-work this? A leather jacket under $100 is definitely going to be the tricky part. I call, “Vintage.” Let’s also find a top, since I think that could be useful.